← Library website changes coming soon! As of 6 June the latest round of book moves are complete. 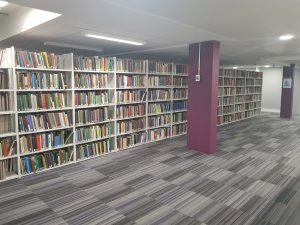 All the books and other materials have been moved to the 2nd and 3rd Floors so that work can start on refurbishing the 4th Floor, which is due to close on 11 June. There are a few works to be completed on the 3rd Floor, but these won’t restrict access to the books and are due for completion on 1 September 2018.